Three masked robbers held up a fast-food restaurant by climbing into the drive-through window early Friday. 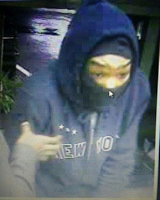 WASHINGTON – Three masked robbers held up a fast-food restaurant by climbing into the drive-through window early Friday. The Prince George’s County Police say that it happened in the 900 block of East Swan Creek Road, in Fort Washington, at about 12:30 a.m. Friday. Once inside, the three suspects pulled out guns and demanded cash. The employees complied, and once the suspects got the money they crawled back out the drive-thru window and ran off. The police are asking anyone with information about the suspects to call 301-772-4905, or, if they want to stay anonymous, 866-411-TIPS. You can also go online at www.pgcrimesolvers.com or text PGPD plus your tip to CRIMES (27637).